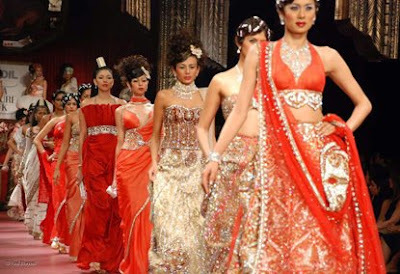 Masala.com recently posted photos from a series of shows which took place in India featuring 11 designers including Manish Malhotra, Rohit Bal and Ashish Soni. In the meantime, here are some of the outfits that caught my eye for one reason or another! A maternity dress??! from Rohit Bal. 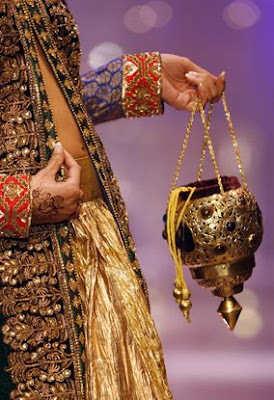 Heavy accessorising on the Manish Malhotra catwalk. Shilpa Shetty modelling for Tarun Tahiliani. Another famous face on the catwalk - Sonam Kapoor wearing Anamika Khanna. All the models at the Pallavi Jaikishan show wore flowers in their hair, loving this outfit by the way! Hey, that fabric on that Rohit Bal dress, oh my god.. its so beautiful! I'd wear it even if it WAS a maternity dress, LOL. And i love the fantasy gharara. Oh this was a great, fun post. I was drooling over every single picture! Actually Indian Maternity wear has already been done, Mamta Maternity by NiraliDesigns.com is the first EVER South Asian Maternity brand and it launched in 2006 and was received very well. It was featured on MTV news to various Print publications across the globe...Bollywood Actresses and other entertainment elite support and represent the brand ...the best thing is the customer policy and nursing features! Check it out...ladies, don't settle for the copy cat buy the original from the designer who specializes in this and INVENTED this! calling all asian fashion fans in Leicester!